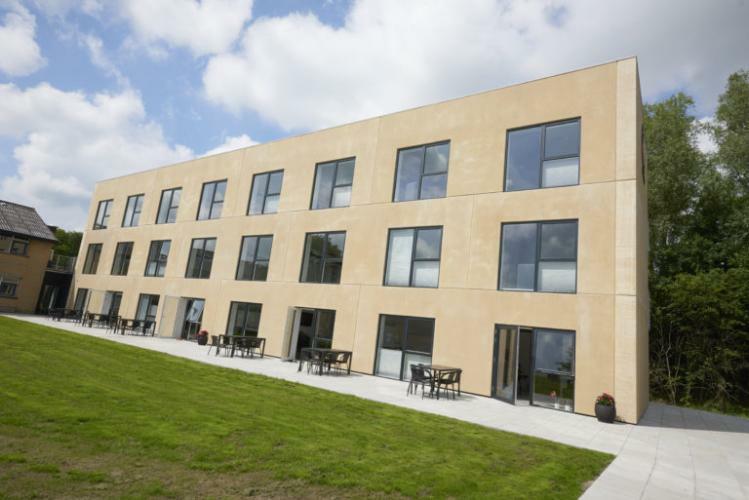 LA LITERAL Bunk beds series is part of the funishing at "Dana Cup Academy", located in Hjørring (Denmark). ‘Dana Cup Academy' is a school for future female football players, both danish and international. It started running in august, 2017 and it is the first center of this type in Denmark as well as one of the best in Europe. The academy offers a full educational and training program and also it provides students with accommodation during the course: appartments for two or four people with bathroom and a dully equipped small kitchenand living room. To furnish the appartments, Dana Cup Academy has counted on SELLEX furniture, more precisely on LA LITERAL folding bunkbeds (designed Lievore Altherr Molina). Thanks to this program of folding bunk beds, the students have more left room for daily tasks, as when they are in close position only take 30cm depth. Dana Cup Academy, Hjorring. LA LITERAL folding bunkbeds. This kind of bunk beds are fairly common in hotels and hostels where space saving is necessary, but also at some hospitals, giving to relatives the possibility to accompany the patients in a comfortable way,while they have to remain in hospital. On this occasion, LA LITERAL has been chosen to furnish a students residence, a type of facility where our folding bunk beds system fits finely. At SELLEX , we are delighted to have been involved in this project and to be part of the development of these future sports professionals.